No audio thread if audio stream < 0. null AudioOutput now still create audio thread. Filter: add X11 text rendering for X11Renderer/XVRenderer. Android: support protocol ‘content’. Now can play from Gallery. Interop with egl support(dma, tfp). libva 0.38 and Qt>=5.5 are required. I have submitted QMLPlayer to windows store. If you are using windows >=8.1 x64 or windows phone >= 8.1, you can search QtAV in the store and have a try. I added a patch for FFmpeg to support multithreading. It was merged to upstream winrt: multithreading support. With this patch, ffmpeg performance is improved a lot. va-api version 0.38 and egl extension EGL_EXT_image_dma_buf_import are required to enable zero copy. Then va-api decoding and OpenGL rendering can get the best performance. It works for display X11 and DRM. You can try it on ubuntu 15.10. Maybe only intel GPU is supported. NVIDIA drivers lack of the required EGL extension. AMD is not tested. 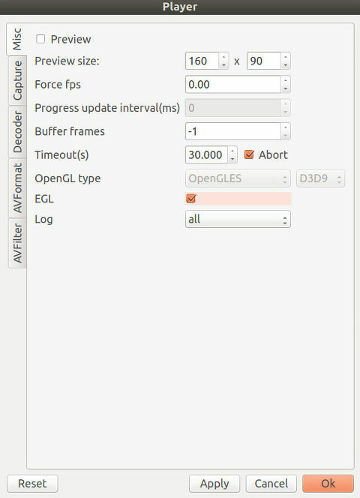 Since Qt5.5, Qt app can run with EGL instead of GLX, using the environment var QT_XCB_GL_INTEGRATION=xcb_egl. 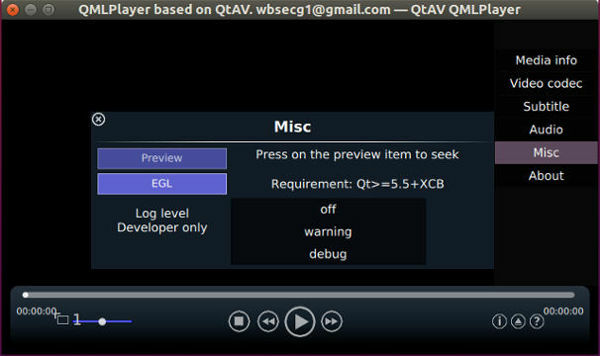 There is an EGL option the player/QMLPlayer setup page, check it and restart.